The fiasco need not have come as such a surprise perhaps. After all we had encountered the A149 before, on the second day of our stay in Norfolk. On a walk featuring dazzling dune lagoons and intriguing Salt Marshes where we harvested samphire for our evening meal, we had only met the odd birdwatcher and a father teaching his son to ride a mountainbike. Then, as we approached the village of Dersingham, where we had a cottage that week, we felt the almighty A149 encroaching upon the silence and solitude we had enjoyed all afternoon. It was not as if we had failed to notice the red line bisecting the area on the map. ‘Red road’ means ‘many cars’, that much we knew as innocent Dutch tourists, but these particular cars kept tearing past at 70 mph in both lanes. The traffic never seemed to let up in either direction. A family of chickens were pecking away diligently in the verge; all of them knew better than to step onto that road. Unfortunately we had no alternative. So we stood around for a while, holding hands for reassurance, kicking our heels in frustration, mustering up courage and debating the best strategy. We would first concentrate on the lane closer to us, we decided, and not until there was a momentary lull in the traffic would we even glance at the other lane. Statistically two such lulls were bound to coincide eventually, weren’t they? Ten minutes later (does this equal about a thousand cars?) I yanked my wife’s arm and we ran for dear life. Safely across, all aflutter, we vowed we would never pull this kind of stunt again. 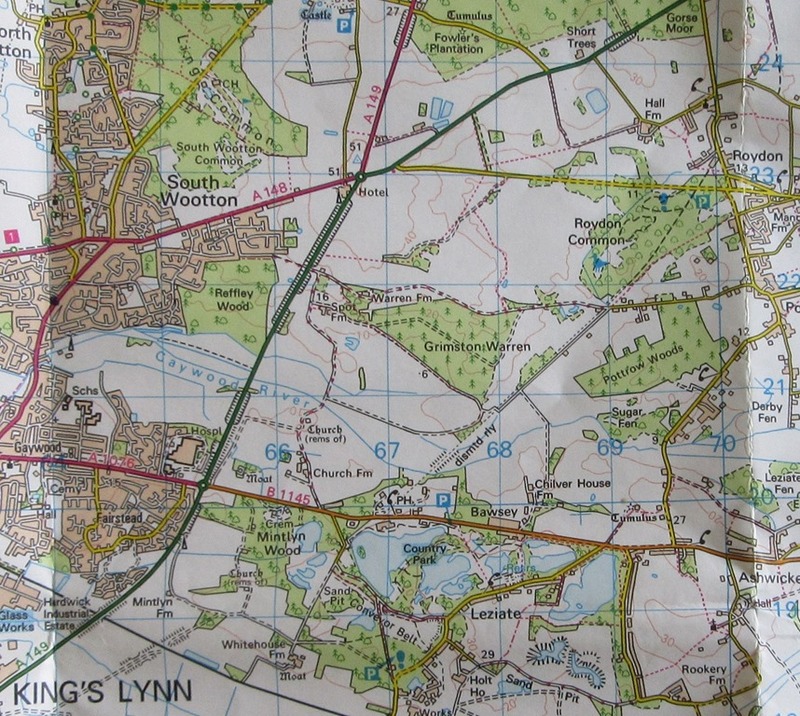 A week later (we were staying at a hotel near King’s Lynn by then) we set off for a walk to Leziate. 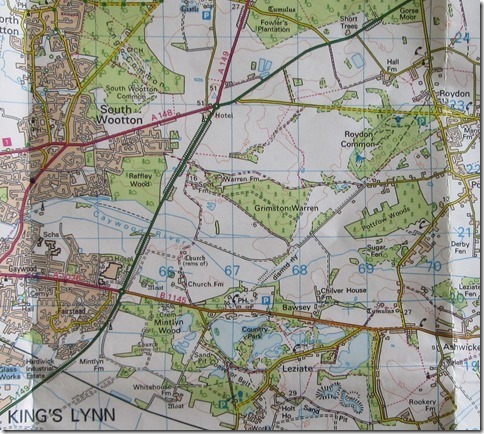 We had taken considerable pains over our route, which was to lead us through the parks of Wootton, through Reffley Wood and across the A149 to a bird sanctuary with some enticing lakes. Anyone smell a rat? On our Ordnance Survey Map this particular section of the A149 had been upgraded to green ( = Primary Route, Itinéraire Principal, Fernestrasse), but as it skirted a residential area we had taken it for granted there would be an underpass or footbridge at the intersection where our dotted line crossed into Grimston Warren. How very naive, you may exclaim, but remember we come from a country where such facilities are as common as saddles on bicycles. No such luck in Wootton, though. Speeding cars they did have, in neverending supply (this was a Sunday, mind you!). Every car jeered or sneered at us, or so it seemed after a while; we had been degraded into second rate citizens, outcasts, beggars for a gap in the traffic. A helicopter would have come in useful, or a lollipop person, whatever. I started praying for some very local seismic event, which would open up a chasm in the road surface and halt the hostile traffic, thus enabling us to pass triumphantly to the other side and continue our walk. Well, in the end we just had to give up: defeated, humiliated, crestfallen. A passing dog owner we accosted understood our plight, but had little to offer in the way of solace or practical advice. “Well, you might try the roundabout…” We had seen that roundabout on the map – all the way through an estate and after a right turn half a mile up the A148 (the A149’s evil twin brother?). When we got to the junction we saw that only the narrowest of sidewalks had been provided. That clinched it. The prospect of an added dose of exhaust fumes and more mind-numbing noise was too daunting. We decided to take our loss and waited for a bus back to King’s Lynn. ‘You are not stuck in traffic, you are the traffic!‘ British punk band The Slaves sing (in Do Something), implying motorists had better look for alternative means of transport. I used to like that lyric, but my own recent experiences suggest this is easier said than done, at least in rural Norfolk. Did the good old Ramblers’ Association still exist, I wondered, or had all its members ended up as roadkills long ago or suffered mass extinction through starvation (lunch boxes depleted, thermos flasks empty) on the hard shoulder of English dual carriageways too busy for them to cross?